MAE SAI, Thailand — Adul Sam-on, 14, has never been a stranger to peril. At age 6, Adul had already escaped a territory in Myanmar known for guerrilla warfare, opium cultivation and methamphetamine trafficking. His parents slipped him into Thailand, in the hopes that proper schooling would provide him with a better life than that of his illiterate, impoverished family. But his greatest escape came on Tuesday, when he and 11 other members of a youth soccer team, along with their coach, were all finally freed from the Tham Luang Cave in northern Thailand, after an ordeal stretching more than two weeks. For 10 days, Adul and his fellow Wild Boars soccer squad survived deep in the cave complex as their food, flashlights and drinking water diminished. By the time British divers found them on July 2, the Wild Boars and their coach looked skeletal. It was Adul, the stateless descendant of a Wa ethnic tribal branch once known for headhunting, who played a critical role in the rescue, acting as interpreter for the British divers. Proficient in English, Thai, Burmese, Mandarin and Wa, Adul politely communicated to the British divers his squad’s greatest needs: food and clarity on just how long they had stayed alive. When a teammate piped up in broken English, “eat, eat, eat,” Adul said he had already covered that point. In images released by the Thai Navy SEAL force, he had a huge grin on his gaunt face. On Tuesday, the border town of Mae Sai, where Adul lived at a church, finally had cause to celebrate, as the Wild Boars’ 18-day ordeal came to an end. In a three-day rescue mission, Adul and 12 others were safely extracted from the cave by a team of dozens of divers, doctors and support staff. The extraordinary rescue of the youth soccer squad has been a rare cause for cheer in a nation that has endured four years of military governance and a growing rural-urban divide. Mae Sai, where the Wild Boars play soccer, seems an unlikely place for a resurgence in Thai pride. Located not far from where Thailand, Myanmar and Laos meet in the Golden Triangle, Mae Sai is home to a population that has, at times been skeptical of the Thai state and its institutions. The Golden Triangle is a smuggling center, and a sanctuary for members of various ethnic militias that have spent decades pushing for autonomy from a government in Myanmar that routinely represses them. Three of the trapped soccer players, as well as their coach, Ekkapol Chantawong, are stateless ethnic minorities, accustomed to slipping across the border to Myanmar one day and returning for a soccer game in Thailand the next. Their presence undercuts a Thai sense of nationhood that is girded by a triumvirate of institutions: the military, the monarchy and the Buddhist monastery. After years of reputational decline because of an army coup in 2014 — one of a dozen successful putsches since the country abolished an absolute monarchy in 1932 — Thailand’s military has been handed an opportunity to burnish its image. Thai Navy SEAL divers became the faces of the rescue operation. And a retired Thai SEAL diver, Saman Gunan, 38, died during the effort to bring air tanks into the cave to aid in the rescue. On Monday evening, Prime Minister Prayuth Chan-ocha of Thailand, the nation’s junta chief, made his second visit to the cave site. Thailand’s monarchy has also been buoyed by the outpouring of support for the 13 members of the trapped team. King Maha Vajiralongkorn Bodindradebayavarangkun, who ascended to the throne in 2016, has engaged with the public more intensely during the caving crisis than at any time during his brief reign. The monarch’s 13-year-old son, Prince Dipangkorn Rasmijoti, wrote a card in German, wishing the rescue mission success, according to the Royal Household Bureau. Among other donations, the king contributed 2,000 raincoats to the effort. With the English he used to communicate with the British divers on July 2, Adul was crucial in ensuring the safety of the Wild Boars. He is the top student in his class at the Ban Wiang Phan School in Mae Sai. His academic record and sporting prowess have earned him free tuition and daily lunch. After crossing into Thailand eight years ago, Adul’s parents dropped him off at a local Baptist church in Mae Sai, asking that the pastor and his wife care for him. A quality education was not available in Myanmar’s self-governing Wa region, where young boys can be in danger of getting dragooned into the local guerrilla force. At least 440,000 stateless people live in Thailand, many of whom are victims of Myanmar’s long years of ethnic strife, according to the United Nations refugee agency. Human-rights groups say the true number could be as high as 3 million — in a nation of nearly 70 million — even though the Thai government has refused to ratify the United Nations convention guaranteeing rights for refugees. With little legal protection, undocumented workers in Thailand can be at the mercy of human traffickers or unscrupulous employers. But the Wild Boars provided a haven for stateless and Thai children alike. On weekends, the squad would often go on outdoor excursions in nearby jungles. While a sign outside the Tham Luang Cave warns that monsoon downpours can transform internal passageways into powerful rivers within a few hours, the boys had explored its caverns before. A forecast of rain on June 23 did not dissuade the team from its adventure. Initially, there was some speculation whether Mr. Ekkapol, the 25-year-old coach who took the boys into Tham Luang Cave, might be criminally culpable for overseeing a trip gone wrong. But local officials quickly dismissed such talk. A stateless member of the ethnic Shan minority, Mr. Ekkapol has long experience caring for children. 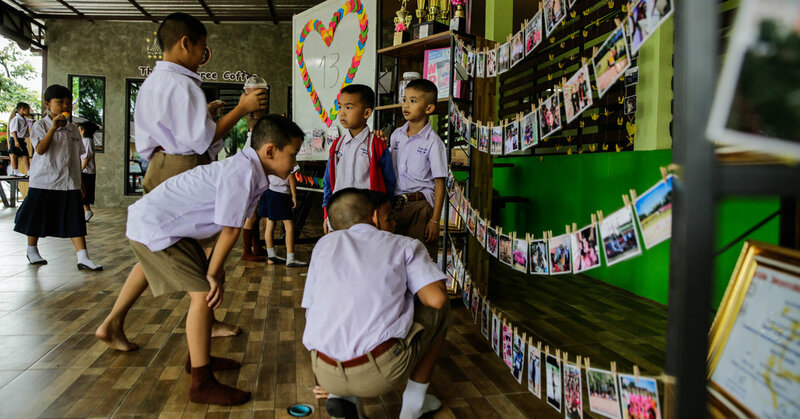 After his parents died in Myanmar when he was a young boy, he entered the Buddhist monkhood in Thailand for nearly a decade, a common option for orphans untethered from financial support. One of Mr. Ekkapol’s duties after he was ordained was taking care of younger novices, said Patcharadanai Kittisophano, a monk at the Phrathat Doi Wao temple, where the young coach now works as a custodian. While in the cave, Mr. Ekkapol sent out a note with Navy divers apologizing to the boys’ parents for having led the team astray. Mr. Nopparat, the head coach, said that Mr. Ekkapol had even withheld food and water from himself in the cave to provide for the boys. As for Adul’s parents, they counseled the only one of their five children lucky enough to study in Thailand to be on his best behavior, even during the most traumatic of times.